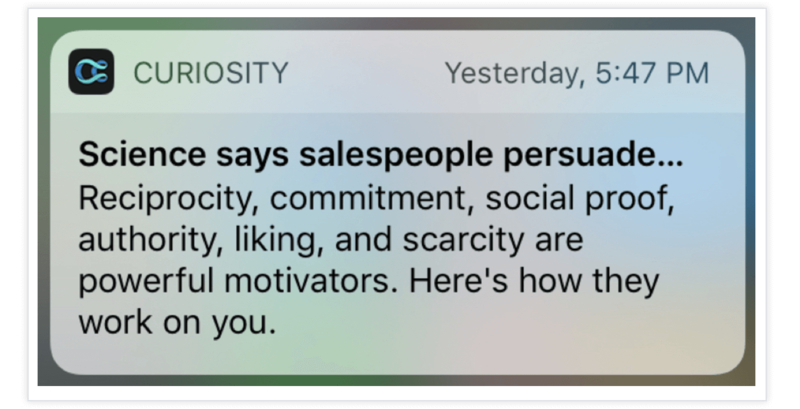 Push notifications are often seen as a disruptive, invasive annoyance. Notifications might come at inconvenient or downright annoying times. Or they might offer irrelevant information and feel impersonal to the user. But push itself isn’t the problem. The way push is being used — by way too many mobile apps — is the problem. And the marketers making these mistakes hurt their ability to reach and retain users, to the tune of 60% of app users turning push off permanently. You can use push notifications to retain more of your mobile users. You just need to understand best practices for doing so. It’s timely: The user’s behavior, location, or preference triggers the notification. It’s actionable: The push makes it clear what the user should do next. So click to the various tip sections below and make sure you bookmark this before you leave. You’ll want to turn to these examples when crafting your next set of push messages. Personal: Yes. The copy implies that my reviews are being seen by “millions of Amazon shoppers,” giving me the sense that my opinions matter. Actionable: Yes. There are two action steps here: “Update your name” and “manage all your reviews.” While I don’t know what “manage all your reviews” means in practice, the fact that Amazon tells me my opinions matter right before asking me to update my name primes me to do it (who wouldn’t want their name associated with their important opinions?). Relevant/Timely: Yes. This is a fantastically timed push notification because of what it makes the user imagine: that their blood donation is right now being pumped into a patient in need. It also references the exact date of donation, so even if the user gives blood regularly, they still know exactly which donation is making an O-positive difference. Personal: Yes, extremely. The copy lets the user know their actions have had a direct impact, and sandwiches this gratifying revelation in between two “Thank you”s. Actionable: Yes. The user may tap to see if there’s more information about the recipient of their blood donation. Or they may not. Either way, they’re likely to want more appreciative notifications like this, so they’ll probably continue to give blood. Relevant/Timely: Yes. Like the other Curiosity push in this roundup, this push was sent at a peak time for smartphone use (after work, before bed). Luckily, it’s written in such an engaging way, it has a fighting chance of standing out in the notification crowd. Personal: Yes. Check out the selective title casing, which lends this push a dramatic flair that adds to its appeal. Think of it this way — if it’s important enough for a headline, we capitalize each word. So, using title casing in other spots signifies that the copy is extra important. Lower-casing “the hidden” also helps to visually set off the words “Arctic Global Seed Vault,” making the push easier to parse at a glance. And the plant emoji confirms what we already expect: this is an article about seed storage in a very unexpected place. Actionable: Yes. Appropriately enough for an app named Curiosity, this notification piques the curiosity gap, and invites users to “Go Inside”. Relevant: Yes. Social and communication apps are among the highest-opened, and people want to know immediately when someone has responded to them. Personal: No, but it doesn’t need to be to encourage the user to tap — since users feel social pressure to respond to messages immediately, especially at work. Actionable: Yes. Though if I were being picky, I’d revise to the more directly actionable “See new message from Michael Feldstein”. Relevant/Timely: Yes. The frequency and timing of these reminder pushes are user-determined inside the app. Personal: Yes, in that the user chooses to toggle reminders on and off, and then sets the timing of those reminders. Actionable: 100%. Simple and to the point (always a push notification best practice!). Relevant/Timely: Yes. Users specify their ideal bedtimes inside Fitbit, which sends a reminder beforehand. Personal: Yes, because Fitbit knows when the user’s bedtime is. However, just the use of the user’s first name would make it seem a little more personal. The push could also speak to the benefits of getting “enough” sleep (without specifying how much sleep the user has told the app they’d like to get). But you can’t argue with the simplicity of this message. Actionable: Nothing directly actionable. But since this is a daily user-defined reminder, it keeps the Fitbit app front and center, where it’s likely to be opened more regularly. Relevant/Timely: Yes. Mint sends this push to help users stay on top of their bills. Personal: Yes. The copy is clear and to the point, and helpfully specifies which account/card is coming due, in case the user has connected multiple accounts and cards to Mint. Relevant/Timely: Yes. This message is pushed when someone swipes on the user’s Tinder profile. Personal: Yep — and borderline rude! This is the copy equivalent of “negging” your users — it’s tricky to get right, but Tinder’s brand and niche mean that it can get away with being a little snarky. Actionable: Yes. It’s a direct challenge to prove Tinder wrong, even though the user might actually agree with the message (or not care at all). Either way, “a new person” is also sufficiently vague enough that the user will swipe for more info. Relevant/Timely: Yes. Kohl’s sent this push mid-morning, so the user is likely awake and receptive, and it’s linked to a tantalizing offer that might be time-limited. Personal: Yes. “Will you?” is immediate to the user — so much so, in fact, that at first glance this push is a little bit jarring. It also assumes that the user will get a discount (i.e. tap). Actionable: Yes. Kohl’s guides the user to “Check the App,” using a capital letter to offset that particular word (see also in this roundup: MyFitnessPal and Curiosity). Relevant/Timely: Yes. Sent around dinner time to users who have previously logged a meal. Personal: Yes — it speaks straight to the user about their behavior, and is written in a neutral, straightforward tone. Actionable: Yes. Bonus points for phrasing this as a question, nudging the user in in the right direction instead of outright commanding. “Would you like…?” makes this push feel more polite than “Do it now”. Other notes: Selectively capitalizing important words, while not totally grammatically correct, helps users scan and read notifications faster — which is crucial when trying to grab a user’s attention and get them to take action. This is a sneaky push notification best practice that’s often misused by apps capitalizing or ALL CAPS-ing every word. Relevant/Timely: Yes. It’s a behavior-based push sent after the user hasn’t taken action after a specified period of time. Personal: Yes. There’s a slight attempt to guilt or pressure the user into opening the app, but it’s lessened by the use of the casual “haven’t heard from you in a while” language. Actionable: Yes. “Write a post’ tells users exactly what to do. Relevant/Timely: Yes. Here’s Jet with a transactional “abandoned cart” message a few hours after I chose a few products but didn’t check out. Personal: Yes, without revealing the potentially embarrassing contents of my cart on my lock screen. “Forget something?” is a gentle poke. It just might trigger the Zeigarnik effect (the idea that we’re much more likely to remember things we didn’t complete than things we did) — and consequently get me to “close the loop” and finish checking out. Actionable: Yes! “Check out now” is a timelessly effective call to action, while the addition of free shipping could help bump undecided users over the edge to purchase. Relevant/Timely: Yes. Amazon sends an abandoned cart notification that’s similar to Jet’s, but minus the probing “Forget something?” question. Personal: Yes — and Amazon does choose to reveal cart contents in the push. While this can be useful to remind a user what they were originally jonesing for, it’s a double-edged sword. What if I’d put something private in my cart? Say, a medical treatment item? Maybe Amazon’s algorithms are smart enough to exclude personal care items from abandoned cart pushes with this exact wording. Actionable: Yes. “Check out now” will forever be the MVP of clear, urgent calls to action. Relevant/Timely: Yes. Spotify pushed this out to users when it added the Beatles to its library. It’s also likely that this user has listened to similar music (e.g. pop-rock, oldies… oh God, the Beatles are oldies now). Personal: Yes. Spotify joins the conversation in the user’s head (see also: Netflix) and uses short, punchy sentences to make this push copy sound like a personal text. Actionable: Yes. “Play music’s greatest catalogue right now” tells the user what to do, and reinforces that this will be a good choice and an enjoyable experience. Relevant/Timely: Yes. Product Hunt sends this push occasionally to alert users of new followers. My guess is that there’s an algorithm to cap this type of push or combine them (e.g. “You have 8 new followers”), since users likely wouldn’t want a constant barrage of new follower updates. Personal: Yes. The upbeat tone turns this push into a celebration. Interestingly enough, “Yippee” is spelled… alternatively, shall we say, which could be an intentional copy tweak on Product Hunt’s part to catch the user’s attention? The exclamation point and hugging emoji underscore that this is meant to be exciting news. Actionable: Yes. Along with building enthusiasm through the copy, displaying the new follower’s profile photo might lead the user to want to know more — and tap. Relevant/Timely: Yes — sent immediately. Personal: Yep. This push refers to “your admin,” “your report,” and “your way,” so it’s definitely about the user. The exact amount of the reimbursement is helpful for users who might have submitted more than one request. Plus, the goofy sound effect and multiple exclamation points signal that this push is here with positive news. Actionable: Yes, albeit a little less directly. Should the user want more info on when and how his reimbursement will reach him, he can tap to find out. Relevant/Timely: Yes. Sent at the end of the day, and Lyft seems to know that the user is at work. If the user has enabled Location Services, Lyft definitely knows where he is. Actionable: Yes. “Try it out,” with no end punctuation except for a caret pointing in the direction of a swipe, makes requesting a Lyft shuttle seem easy. Relevant/Timely: Yes. The user has expressed interest in tracking their gratitude, and this push is meant to help them do that. It’s a “you asked for it” kinda thing. Personal: Yes, including the use of “your,” the text smiley, and the lack of end punctuation. Actionable: Yes. “Share your happy moment” is a command, but feels gentler thanks to that smiley. Other notes: Adding the social proof of a study helps users feel like they’re not alone and boosts retention by promising benefits. Relevant/Timely: Yes. 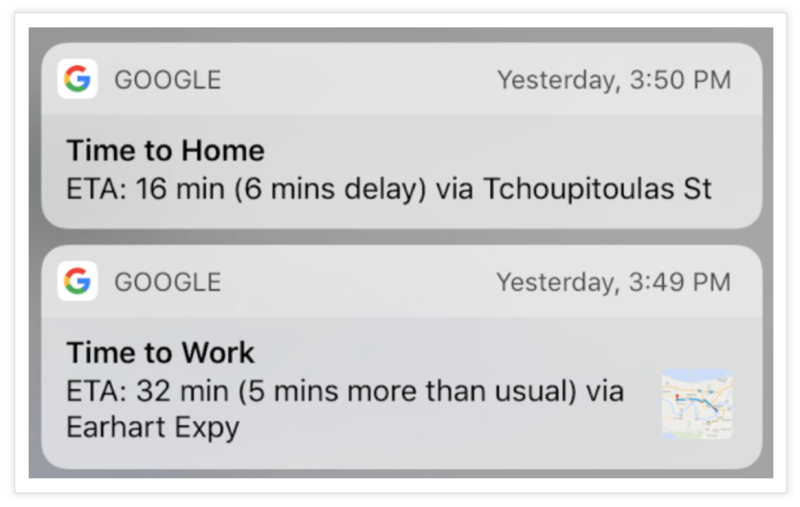 Look at the clever timing of this push — instead of being sent on the hour or half-hour, it’s sent at a seemingly “random” time, meaning it’s more likely to appear on a less-crowded notification tray. Plus, it shows up right when many users are just getting off work between 5 and 6. Personal: Yes. “Here’s how they work on you” is both personal and an invitation to tap. Actionable: Yes. Along with the “Here’s how they work on you” phrasing, “Science says” appeals to our natural inclination to be on the cutting edge (or just know about it). Relevant/Timely: Yes. The user has subscribed to weather updates from a specific area. Personal: Yes. Even though 18 million other people in Mumbai will experience the same weather, TWC calls it “your forecast”. Actionable: Yes. Here’s the twist: TWC positions itself as the authority to trust, instead of leaning on others. “The world’s most downloaded weather app” is a heavy-hitting form of social proof — and while TWC can’t very well call itself “The world’s most accurate weather app” and back that up with data, it can point to App Store and Google Play download numbers in a heartbeat. Timely/Relevant: Yes. Netflix is relying on its data about this user’s interests to offer personalized suggestions for shows. Personal: Yes! Engaging, lighthearted copy that still gets its point across. That’s a push notification best practice if we’ve ever seen one. Actionable: Yes. “Watch the trailer” tells the user clearly what to do next. Relevant/Timely: Yes, in that it’s an unusual piece of news. The user may also have indicated an interest in religious content, or in Nebraska news. Actionable: Yes. This Android push offers not one, but 3 clear calls to action: “Share,” “Save,” and “View”. Relevant/Timely: Yes. Who doesn’t love pizza and, well… we’ve all had an awkward interaction with a delivery guy. Personal: Yes. The jokey question sets up the lede of this article, while the two emojis complement the actual photo preview from the linked article. Actionable: Yes. News about self-driving cars by itself isn’t necessarily actionable, but by tying the news to something many people have done at least once (ordered a pizza), Moneystream compels the user to tap to see when self-delivering pizzas will be available in their area. Relevant/Timely: Yes. The user has signed up for price alerts on this flight. The push is sent when the price changes. Personal: Yes. Notice the extremely clipped phrasing of this notification. Its sole purpose is to give the user the information they’ve asked for, without wasting any time. It’s also thoughtfully constructed in that it gives the new flight price ($414) and the amount it’s gone down ($104) — instead of just comparing the new price to the old price. No math required on the user’s end! Actionable: Yes. If this is a good enough deal, the user will tap to open the app and book the flight. If it’s not, he might open the app to set a new alert or to browse alternative flights. Either way, this notification provides value to the user and helps position Skyscanner as a useful app worth keeping. Relevant/Timely: Yes. The user has signed up for checking account alerts so he can keep an eye on any unauthorized use of his account. Personal: Yes. It gives all the details about the relevant account, transaction location and time, and exact amount. At a glance, the user can see whether he recognizes the transaction or not. Actionable: Yes. If the user doesn’t recognize the transaction, he can tap to learn more and contact Chase about any unauthorized charges. If he does recognize it, he’ll feel comforted that Chase has his back. Relevant/Timely: Yes — sent ahead of the weekend. Presumably, this is sent to active users who might use their GoPros more on the weekend. Personal: Yes. The push suggests that a person who owns a GoPro would have weekend plans exciting enough that they need to be filmed. Also, “Weekend plans?” is a brief and casual way of setting the context for this notification. Actionable: Yes, but not immediately. If this user DOES decide to film over the weekend, though, they’ll be using the GoPro app. Relevant/Timely: Yes. This notification is sent when the last queued social update is posted from an account linked to Buffer. Personal: Yes. It even specifies which Twitter profile’s queue is empty, for users who might have more than one Twitter account linked to Buffer. The cutesy use of “Zoinks” is just enough personality without obscuring Buffer’s message. Actionable: Yes. “Head over here to fill it back up easily” not only tells the user what to do but makes it sound simple. Personal: Yes. Like the other Buffer notification here, it specifies which Facebook profile’s queue is empty, for users who might have more than one linked Facebook account. “You did it!” makes the user feel accomplished. Actionable: Yes. “Ready to Buffer some more?” is clear without being aggressive, and since it follows an encouraging “You did it” message, the user is primed to accomplish more. Relevant/Timely: Yes. 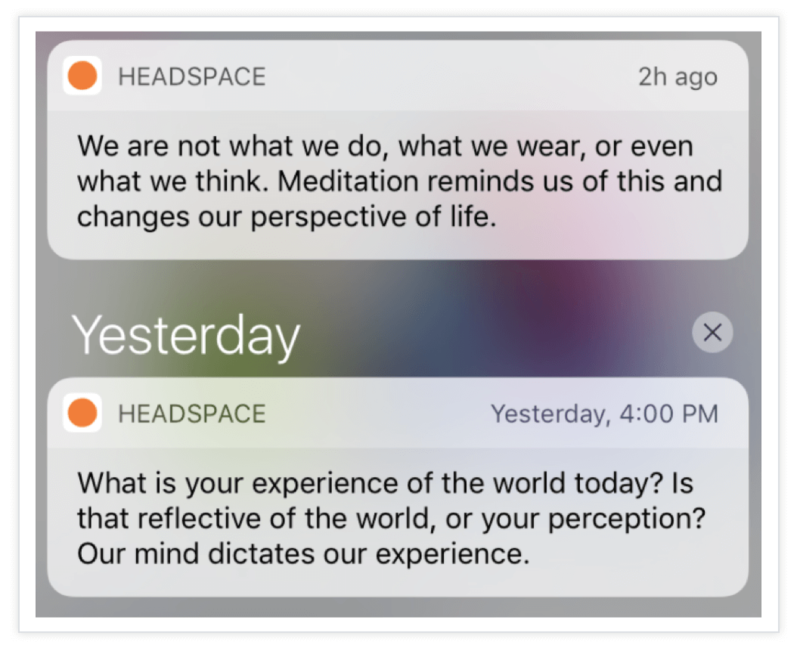 The frequency and timing of these “Mindful Moment” pushes are user-determined inside the app. Personal: Yes. The second push addresses the user as “you” and asks questions. Actionable: Not directly — but consider how these pushes would foster a mindset that encourages the user to meditate. Other notes: These thought-provoking notifications stand out in a blur of calendar events and Snapchats. Relevant/Timely: Possibly. Could be based on the user’s past history on Imgur. The early evening send corresponds to a time of day when most people are off work and ready to relax — possibly with some entertaining memes. Personal: Yes! And funny. The combination of a well-known pop culture reference (Lionel Richie, if you’re confused) that also happens to be a question and includes a pun is a home run. Actionable: Yes. If it is memes the user’s looking for, now they know where to find them. Relevant/Timely: Yes, and even references the time of sending. Personal: Yes. The copy stands out for its wry tone and lively use of both antiquated (“olden”) and modern lingo (#nostalgia). Actionable: In a subtle way, yes. It implies that the user is not, in fact, screwed if they haven’t made a dinner reservation yet — and that they can tap to make one now. Relevant/Timely: Yes. The push copy refers to the day of the week, and I wouldn’t be surprised if this were a regular weekly promotion. Personal: Yes. It paints a picture of “what will happen when…”. Casual language like “gonna” and references to the imminent zombie apocalypse make this push feel light-hearted even while it sells. 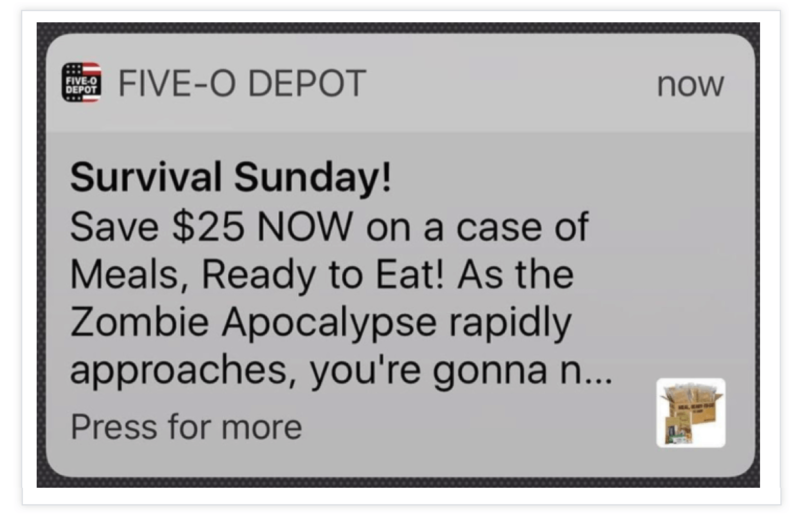 Plus, the selective capitalization of NOW, Meals Ready to Eat, and Zombie Apocalypse gets the message across at a glance. Actionable: Yes. “Save $25 NOW” tells the user exactly what to do and when to do it. Relevant/Timely: Yes. Sent immediately following the MLB Players’ Weekend to a Dodgers fan. Personal: Yes. This copy appeals to baseball fans who want to know more about their favorite team’s inner workings, and the trailing ellipsis and hesitant “… Chicken Strip?” phrasing mimic how a real person would speak this sentence out loud. Actionable: Yes. The user will probably want to know which player somehow ended up with the moniker “Chicken Strip,” and tap to find out. Relevant/Timely: Yes. I got this push notification the same day I’d tapped around inside Jet for a few minutes. It was the first push they sent. Personal: Yes. A welcome message is always nice, and the parenthetical hint is not only funny but weirdly correct. Maybe Jet pulled demographic data on my birth year and assumed that since I’m a millennial, I love LaCroix (true). Plus, Jet takes this opportunity to reiterate its value proposition: buy things together and they’re cheaper. It’s one of the best push notifications I’ve seen in the e-commerce realm. Actionable: Yes. “Go crazy on LaCroix” is specific and actionable — and if I don’t like LaCroix, I can guess that adding multiples of a different product will have the same effect. Relevant: Yes. Messaging app pushes are among the highest-opened, and people want to know when their conversations are moving forward. Personal: No, but it doesn’t need to be to encourage the user to tap. Actionable: Yes. Knowing that an employer viewed their application will encourage the user to tap through and check for related notifications, either now or later. Other notes: Makes the user feel like she’s getting insider info, vs. traditional resume submission, which is a “Drop it off, cross your fingers and hope to hear something” situation. Relevant: Yes. Sent a few days before an upcoming football game. Personal: Yes. The peppy tone of this copy apes a fan’s enthusiasm for the sport, and the football emoji drives the point home. “Thru” is a time-saving mechanism that also makes the copy feel more casual, and the multiple exclamation points add urgency. Actionable: Yes. This is a time-limited offer that would encourage interested users to tap to see what the “and more” includes. Relevant/Timely: Yes. It’s based on the start of football season and encourages app retention by inviting the user back in to reactivate their league. Also, it was sent right around lunchtime, when lots of folks take a break and check their phones. Personal: Yes, though I’d love to see something like “Reactivate [Your League Name]” to make it even more personal. The urgency of the caps and double exclamation point might run the risk of alienating less-engaged users, though. Actionable: Yes, with a specific two-step set of instructions. Relevant/Timely: Yes. Saucey is an alcohol delivery app, so… it makes sense that this push is about tequila. The user may well have ordered tequila through Saucey in the past, too. Personal: Yep. This is the copy equivalent of a little red devil sitting on the user’s shoulder. An irresistibly fun flip happens between the start of this familiar adage and the end, and Saucey knows it — which is why they’ve included that sheepish-grin emoji. Actionable: Yes. If the user decides, “You know what, I’m gonna do it!” and taps through, great. If she decides not to, she’s still gotten an entertaining push from an app that knows how to speak to its target users — and those good feelings are gonna linger. Personal: Yep — and sarcastic. The “sorry not sorry” vibe of this push is accented by a shopping bag emoji, and the lack of end punctuation leaves the copy feeling unfinished… which might just coax a user to tap. Relevant/Timely: Yes. Sent at the end of the day. Personal: Yes. It addresses the user as “you” and asks a question. Actionable: Yes. It’s an implicit ask; the user wants to say yes and will be motivated to tap. Remember, though: when you’re writing push notifications that require a certain answer from your user, make sure you phrase the question in a way that will encourage the answer you want. Relevant/Timely: Depends on whether the user’s data indicates they live near or are interested in Appalachia. Personal: Yes, in that the copy is written simply and conversationally. Relevant/Timely: Absolutely. Who doesn’t love sloths? Personal: Yes. The playful word choice makes this push a keeper since users will probably never again get a push notification about “baffled zookeepers”. And they probably have the same question, come to think of it. Actionable: Yep. Any user who wants the answer will assume the article contains it, and tap to read more. Relevant/Timely: Yes, extremely, in pure calendar terms. Personal: Just personal enough, without assuming that the user has someone to eat Valentine’s Day dinner with. Actionable: Yes, and urgent, too — “Find a table before it’s too late” conjures visions of fully booked restaurants. If your offer is time-limited or based on a calendar event, giving the exact time left to get the offer is a push notification best practice. Relevant/Timely: Yes! This is an excellent example of a location-based push. Personal: Yes. The user is presumably a football fan who’d be thrilled to have a photo with the Lombardi Trophy. And the emphasis here is on being in the photo with the trophy (it’s not “Take a photo of the Lombardi Trophy,” which sounds much less exciting). Actionable: Yes. “Get your picture taken” is a straightforward call to action, and the push lets the user know how far away they are from the trophy. Relevant/Timely: Yes, extremely. It lets the user know ahead of time that a major route will be inaccessible. Personal: Yes, because Waze knows the routes this user often takes. Actionable: Yes. The user will tap through to find an alternative route. Relevant/Timely: One of the most relevant, timely, location-based pushes in this roundup! And one of the best push notifications I’ve seen period, for its helpfulness. Personal: Yes, in that it knows the two locations where the user is likely to travel. Actionable: Yes. Like the Waze road closure reminder, this push encourages users to tap to get directions. Other notes: The small rich-text map image offers a preview of what the user will see when they tap, acting like a click-trigger to assuage the fear of the unknown. Relevant/Timely: Yes. Though 2025 is far off, Brexit happened fairly recently — and is expected to have a worldwide impact. Personal: Yes. The copy references BuzzFeed itself, lending a lighthearted spin to what seems, on closer inspection, to be a doomsday prediction. Actionable: Yes. The user will read this and want to connect the dots between nuclear science, Brexit, and the loss of electricity (underscored by the lightning bolt emoji). Relevant/Timely: Yes. The app sends this push after a user has checked out of their Airbnb. Personal: Yes — its goal is to get the user to rate her stay while assuaging any worry about the mutual rating process, which Airbnb knows is stressful for some users. Actionable: Yes. The use of the phrasing “it’s time” instills urgency. Relevant/Timely: Yes. Sent right after the user successfully receives their order. Personal: Yes, including the use of “your” and the location of the McDonald’s from which the user ordered (just in case they ordered from multiple McDonald’s at once). “You can also add a tip” is a wonderfully neutral way to give users the information they need without any pressure. Actionable: Yes. “Please rate your delivery” is straightforward and sounds easy. Also, saying “please” never hurt anyone. Relevant/Timely: Yes. Sent immediately, as a user receives an Asana message or comment. Personal: Yes. Compare this message to Drift’s message notification. Drift keeps the content of the message private, only alerting the user to the fact that they have a message. Asana, on the other hand, previews the message content. This stimulates the user to tap and react immediately — which is great for app retention but may not be 100% appreciated by all users. So your mileage may vary. Actionable: Yes, since people feel social pressure to respond to messages immediately. Relevant/Timely: Yes. News apps have a little bit of a pass when it comes to “relevance” (and some users do find news push notifications inappropriate for things like celebrity babies). But in general, a premeditated police murder is newsworthy and thus relevant. Personal: Yes. This copy appeals to humans’ innate desire for compelling stories. It reveals the beginning and end of the story but obscures the middle. We read this and we want to know: Why did no one stop Bonds? What desperate situation arose for this tragedy to happen? Actionable: Yes, since the user will want to fill in the blanks. 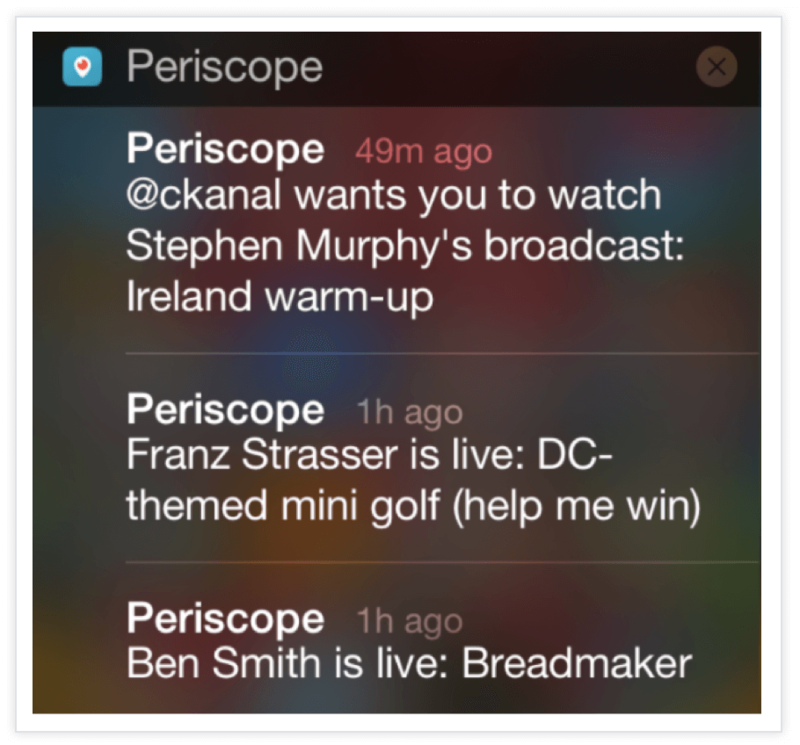 Personal: Yes, especially the notification which reads “[name] wants you to watch…” In this way, Periscope makes it feel like they’re not the ones notifying you — instead, it’s your friend who wants you to watch something. Actionable: Yes. By placing the “[name] is live” copy ahead of additional details, the app encourages engagement. As soon as the user is finished reading those additional details, they’ll know exactly what’s in store after they tap. Timely/Relevant: Yes. These notifications are sent in real-time as followers interact with Instagram. Depending on the recipient’s closeness with the user going live (determined by interaction with that other profile), this could a be incredibly useful notification. Personal: This push copy is a bit more matter-of-fact, in line with other Instagram notifications. Actionable: Yes. “Watch it before it ends!” with an exclamation point lets the user know this chance won’t last forever. Relevant/Timely: Yes. Like other messaging apps, notifications are instant. Personal: Doesn’t need to be, assuming you’re interested in what the person typing has to say. Actionable: Yes. 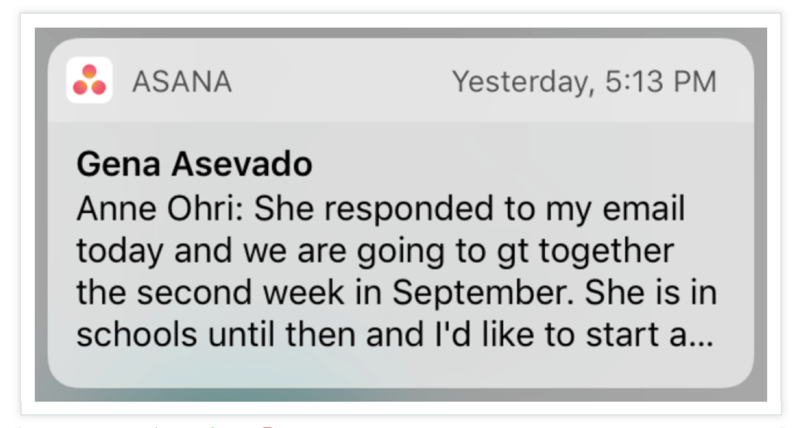 People feel pressure to respond to messages immediately, so letting users know that their conversational partner is typing AND that they’ve sent a message keeps users glued to the app. Relevant/Timely: Yes. Sent on Saturday evening. Personal: Yes. It paints a desirable picture of a relaxing night, using playful emojis. And our data showed an average CTR uplift of 124% with pushes that used emojis. Actionable: Yes. “Order your drinks” tells the user what to do, and the carets in place of end punctuation are a common way to urge users forward. Relevant/Timely: Yes. Sent in conjunction with the release of a special edition of the NYT Magazine. Personal: The freewheeling use of emoji to replace words in this push make it stand out, especially in conjunction with the NYT’s more staid image. Notice the use of all-caps to point out the copy’s most important message: the release of the All-Comics issue. Actionable: Yes. If the push notification is this much fun, the comics themselves should be fascinating. Relevant/Timely: I’m of two minds. This was sent 30 minutes before the end of the traditional 9-5 workday. Does a user really need to “keep going”? Or would this have worked better an hour or two before? Personal: Yes. Likely based on stations the user has listened to before. Actionable: Yes. “Listen now” is straightforward. To me, though, it feels a bit too much like a command. Relevant/Timely: Yes. This user’s most frequently listened-to station is Erroll Garner Radio. It was sent at the beginning of the day when this user was likely to be picking out work music. Actionable: Yes. This is the same “Listen now” simple imperative as the other Pandora notification. Relevant/Timely: Yes. Interestingly, this push was sent at 8:30 AM to promote a same-day 9 PM flight deal. Depending on how busy the user is, this could be way too early… or it could be just in the nick of time for the user to set aside time tonight. Personal: I’m going to give this push a pass for personality since flight deal apps tend to rely on the user’s imagination (“Wouldn’t it be amazing to score a cheap flight to Shanghai? What would I do? How long would I spend?”) to relay their benefits. Actionable: Yep. There’s a ton of info packed in these few lines: the exact terms of the deal and how long it lasts, how much cash the user will get back when she/he books, and what code to use for the deal. Rich media push notifications allow you to add GIFs, photos, videos, audio, and custom CTAs to your push notifications. For a creative mobile marketer, the benefits are endless. Plus, rich pushes are so new that barely any brands are using them — so they’re low-hanging fruit ripe for the picking. Relevant/Timely: Yes. 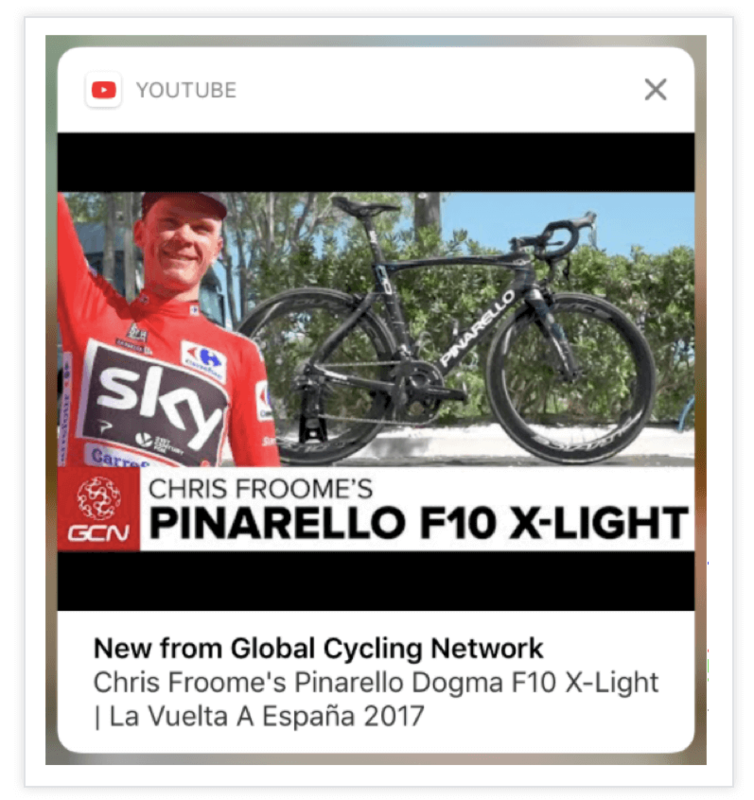 The user has likely subscribed to cycling channels on YouTube and will be interested in push content about races, gear, and riders. Personal: While there’s not really explicitly personal language in this push, we know it’s relevant to the user’s interests. I’d love to see something as simple as “Want to see Chris Froome’s bike?” to position the push copy more personally. Actionable: Yes. Look how much real estate that big, gorgeous picture of the bike in question takes up. YouTube can also take advantage of custom CTAs when the user presses and holds the push: “Watch” or “Share” are two common custom CTAs with rich push notifications. Relevant/Timely: Yes. Sent as breaking news. In addition, the user has almost undoubtedly opted into NFL updates, or more specifically, Detroit Lions updates. Personal: Again, there’s no outright-personal language here. 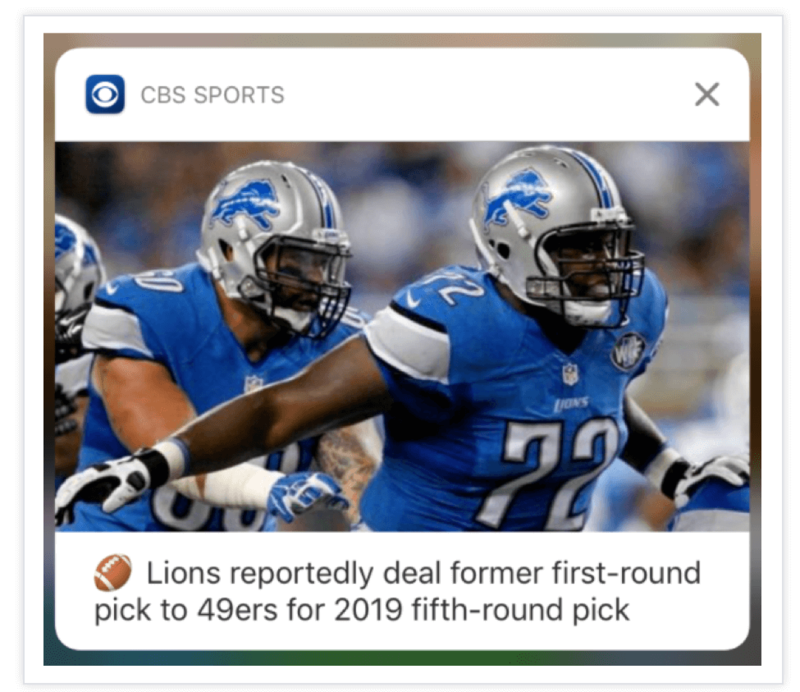 But look closely at the position of #72’s hand over the football emoji — that’s some pretty excellent, subtle work that could easily be seen as an intentional visual joke! Actionable: Yes. There’s no direct CTA, but a football fan might well read this and tap through to learn more about the Lions’ reasoning. Other notes: Don’t overlook the use of “reportedly”. This cues the user that this is breaking and potentially as-yet unverified news. Relevant/Timely: Yep. DoorDash updates the user when their food is on its way, so they’re ready and waiting for it. These types of pushes fill the gap in between placing an order and waiting around for a knock on your door, helping users feel more in control and in the know. Personal: Yes, and one of the most personal and polite (without being formal) notifications on this list. The copy includes a greeting with the user’s name, gives the info he’s looking for and includes a text smiley instead of an emoji — which makes this feel more like a one-on-one text than a formulaic auto-message. Actionable: Yes. The user can assume that when they tap, they’ll see more information on the location of their Dasher and tasty Mexican food. Relevant/Timely: Yes. Sent before users with a 9-to-5 need to be head down at their desks. Quora is banking on a few minutes of pre-work “getting settled” time when a user might play around on their phone before putting it aside and starting work in earnest. Personal: Yes. References the user’s existing digest, and lets them know exactly how many items are saved for them to read through. Actionable: Yes. Showing a specific question, on a topic in which the user has indicated interest, will automatically spark answers when the user reads it. They’ll want to weigh in.